Get the most out of your training with triathlon training camps & clinics! Learn how to reach your best performance in an out-of-town setting. All in a fully supported environment with like-minded athletes! Whistler - June 21st and 23rd, 2018 - DETAILS and REGISTRATION COMING SOON! Cycling Studio – Ready to Go! The cycling studio is ready to go! I've been working hard getting everything in place to launch the first spin sessions starting on Sept 24th. It's really exciting to have such a great space as a centre for all of my operations beginning this fall. With 1200 sq ft of space, there's plenty of room for lots of athletes to train together and enjoy some good, solid workouts. 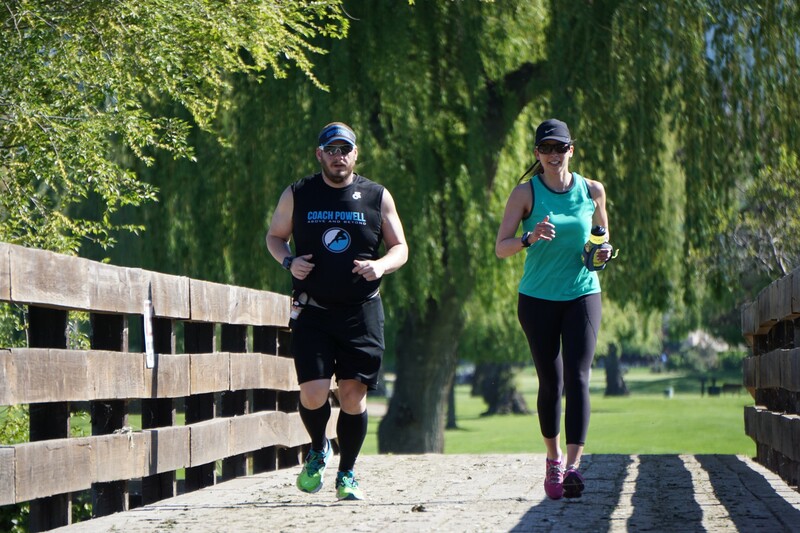 The studio is conveniently located right next to Jericho Park making it a great spot for some awesome transition run workouts for the triathletes in the group. This will also be a perfect base for some great training camps and clinics throughout the year. 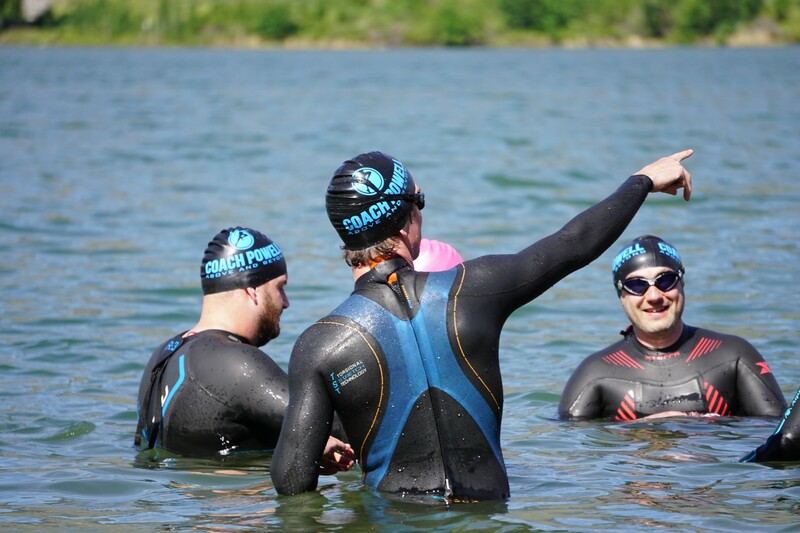 With Jericho Beach only a short walk away it will be great staging point for open water swimming during the warmer months. The photo below shows the main spin room (only half of the studio space) where 18 trainers can fit comfortably, 7 more trainers can fit right behind this with a full view of the main room with the projector. Please note that this website is still under construction, there a few things that will need to be fixed. Expect some changes and things to be tidied up soon! If you're interested in joining the fall spin sessions or simply finding out more information about the indoor cycling groups then please click HERE. Find your race pace and training pace using this run pace calculator. Having trouble figuring out what your various race paces are? 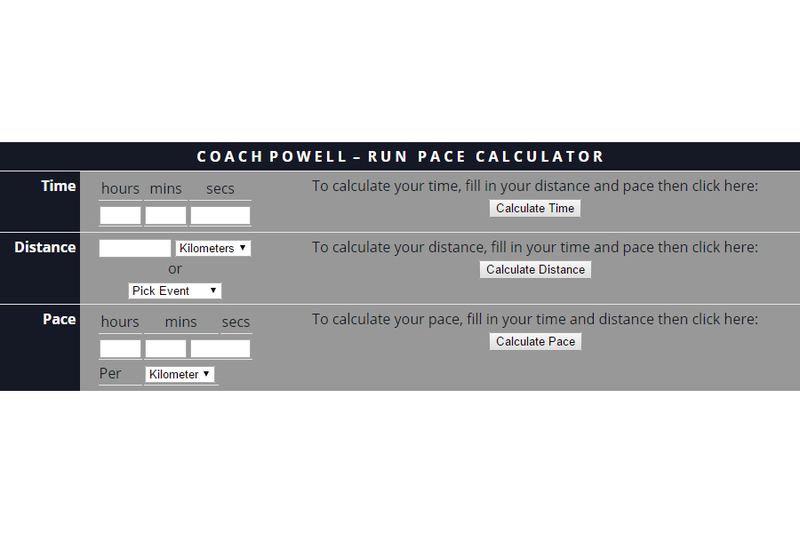 This simple and easy to use run pace calculator will do the math for you! If you run with our group at the track, this can be particularly helpful for determining your various race paces for specific interval workouts. Using the run pace calculator you can easily convert your 5k, 10k, Half Marathon and Marathon race pace into 400m or even 200m split times. The run pace calculator will even give you precise splits for every point of your next race. Have fun and please contact us if you have any questions! 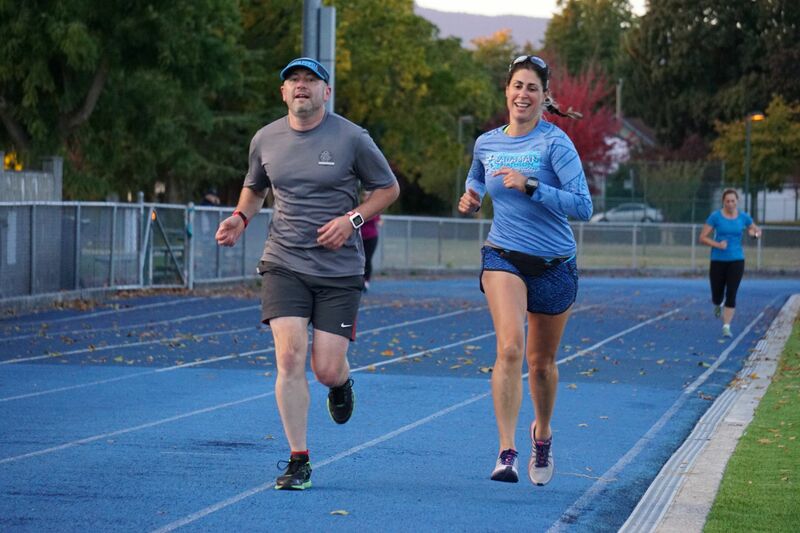 If you would like to find out more information about our fun and challenging weekly track workouts, please visit the Vancouver Track Workouts page HERE. Find all of the most popular Vancouver cycling routes right here! Join thousands of local road cyclists and triathletes along these fantastic scenic roads! See everything that you need including distance and elevation gain, as well as the ability to view the gradient of individual climbs. Simply drag your cursor along the elevation graph to see where each hill is on the map as well as the current gradient. Please note that due to varying connection speeds, the maps may take 15 to 30 seconds to load from the server. The majority of these Vancouver cycling routes are calculated as return trips starting from Kitsilano. If you're looking for some extra motivation to workout and build your strength and skills for your next Gran Fondo or triathlon, you may be interested in our outdoor interval workouts. During the fall and winter we also offer indoor cycling workouts at our Jericho studio. Please click on the links for full details. This is one of the most popular Vancouver cycling routes for road cyclists and triathletes. With some spectacular views along the way, this ride will take your breath away! Prepare to be blown away by the beautiful view when you arrive at Deep Cove. This is a very popular ride and a favorite for many cyclists. We're very lucky to have so many great Vancouver cycling routes here in our back yard. This can be done as an out-and-back although it is shown here with an alternate return route along Seymour Parkway. The famous (or should we say "infamous") Seymour Mountain can also be added if you're up for the challenge! Of all the Vancouver cycling routes, this is possibly the most peaceful ride that you can do. The full sized 20km out-and-back forest road is closed to vehicles and the pavement is smooth and divided for cyclists. The quiet shelter of the forest is a great escape from the busy city streets. It is shown here as an extension of the Deep Cove route but you can reduce this to 70km if you go directly up Mountain Highway and cross over to Lillooet Road via Fern Street. This is possibly the most popular of the Vancouver cycling routes and is one of the staple rides for many road cyclists and triathletes in Vancouver. Iona is also a great place for doing specific uninterrupted interval workouts on flat terrain. This ride starts with some rolling terrain but is mostly a flatter ride. It ends at the Sanctuary Cafe , a bike-friendly, community coffee shop exclusively featuring coffee roasters and artisan baked goods from BC producers. Sanctuary Cafe is strategically located on a main cycling route in Richmond that is used frequently throughout the year. The cafe also has a room where you can hang your bike so that you don't have to worry about your ride while you enjoy the coffee. This is a great location to start, finish or stop along the way for a drink or refreshment. You can extend this ride by riding out-and-back along Dyke Road or adding Iona Beach on the way out and/or back from Steveston. This a great route if you're looking to go long and keep it flat. Expect to see lots of other cyclists along the way. River road is also a good destination for doing intervals if you're training for a race or an event. This is one of the most popular Vancouver cycling routes. This route is perfect if you're looking to ride for over 3 or 4 hours and you want to keep it flat. You can also modify and shorten this route by taking No. 5 Road or No. 6 Road and head directly North back to River Road. Another option, if you want to lengthen it, is to add Iona Beach at the beginning and/or at the end. Test your strength on this epic climb! The views from each lookout on the way up Cypress Mountain are magnificient, a well deserved reward for the hard work that it takes to reach the top. It's possible to take short cuts to get to the start of the climb, one possibility is to climb up via 15th Street although expect a substancial gradient on the way up to the highway. The average gradient on Cypress Mountain is between 6-8% for most of the climb although due to the easier switchbacks, the overall average is approximately 5.3% for 10.5km from the first switchback up to the power lines. This map shows the climb up to the Hollyburn Lodge where you can find bathrooms and water, you can also go all the way to the lodge at the downhill ski area if you choose. The 15km climb from the highway to the Hollyburn Lodge is the route which is used for the annual Cypress Challenge. Have you got what it takes to ascend this awesome local climb? With over 1000m of elevation from sea to sky, this ride will be one to remember and talk about! The average gradient is approximately 6.8% for 12km's although the initial 3.5km's is 8.2% average with some segments around 10%. This is the most challenging of the local Vancouver cycling routes with regard to total distance and elevation for a single climb. The sea to sky highway is one of the most beautiful highways in the world, this is possibly the most stunning of all the Vancouver cycling routes. You may want to take a break to soak in the view, it's amazing! The pavement surface is very good with nice wide shoulders although it can get a bit dirty during the rainy season. This route turns around at the Lions Bay Cafe where you can take a break and refresh if needed. If you're training for a long and hilly endurance event then this would be a good route for you. This route turns around at the popular Galileo Coffee Company where you can stop for food and drinks. Another variation on the Sea to Sky route, you can go as long and far as you want along this highway. This map turns around at Cleveland Ave which is the main intersection when you first get into Squamish. There's a Nestor's Market and a gas station to refuel and fill water bottles if needed. If you spend a lot of time on your bike and you're getting bored of riding the same Vancouver cycling routes over and over again then here's a good one that you can add to your repertoire. This mostly flat ride will take you all the way to the Tsawassen Ferry Terminal. If you're looking for an epic hill climbing challenge, this ride is for you! 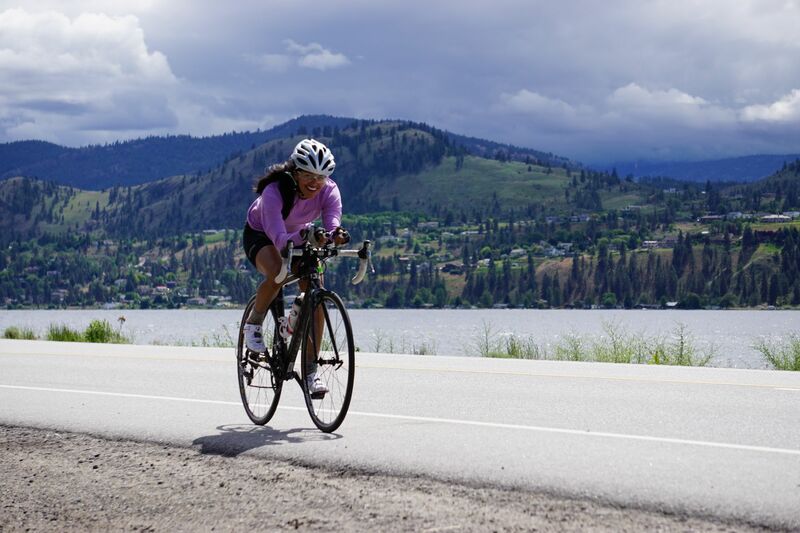 The Triple Crown is one of the most challenging Vancouver Cycling Routes with three seperate mountains to climb. 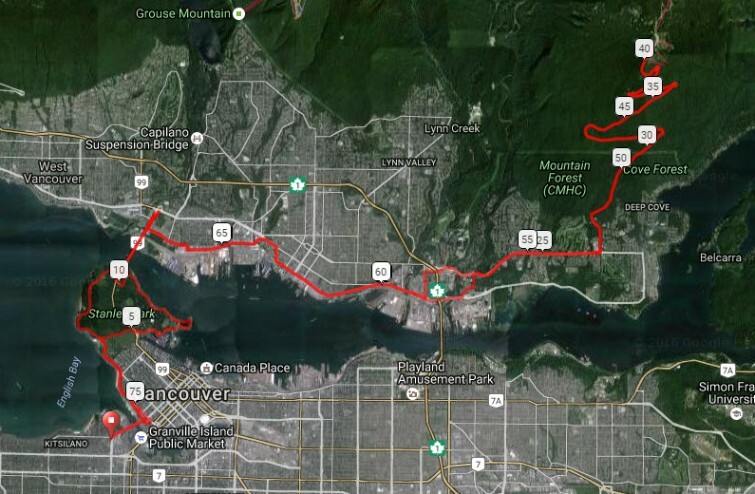 There are several variation of this route, it's possible to do it with less distance and total elevation by returning to Capilano Rd to climb to the base of Grouse via the lower roads. This variation will get you over 3000m of climbing (that's approximately 10,000 feet!) over a distance of 144.5km (90 miles). Be warned, the views are breathtaking! So many great local Vancouver cycling routes! This is a good one for endurance cyclists or triathletes who are training for a GranFondo or an Ironman event. It covers approximately the first 2/3's of the Whistler GranFondo but with the return trip is actually over 40km longer. If you're looking for a great place to ride with very few interuptions along the way then this is a great alternative to the regular mainstay Vancouver cycling routes. 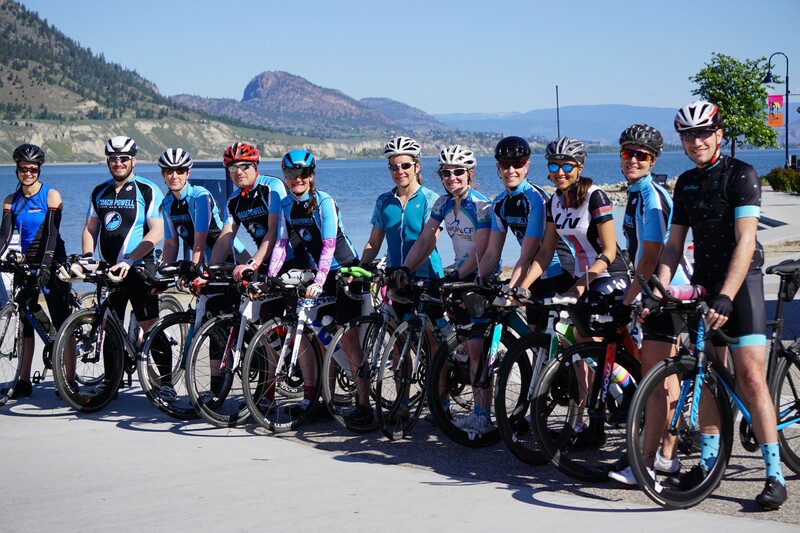 If you live in Vancouver it will require a little bit of extra travel time to get there but it's well worth the trip if you have a long ride planned in your training schedule. Shown here is the long version of the route all the way to Cultas Lake although you can make this ride as short or as long as you wish by simply turning back at any point. There are gas stations along the route where you can refill bottles and buy food including one on Huntingdon Road at kilometer 38 as well as another on Yarrow Central Road at kilometer 66. Thanks for visiting our page, we hope that you enjoy many hours of riding on these great Vancouver cycling routes! Learn what it takes to master T1 and T2 with our triathlon transition clinics. Gets tips from the pros and practice your technique to be ready for race day! 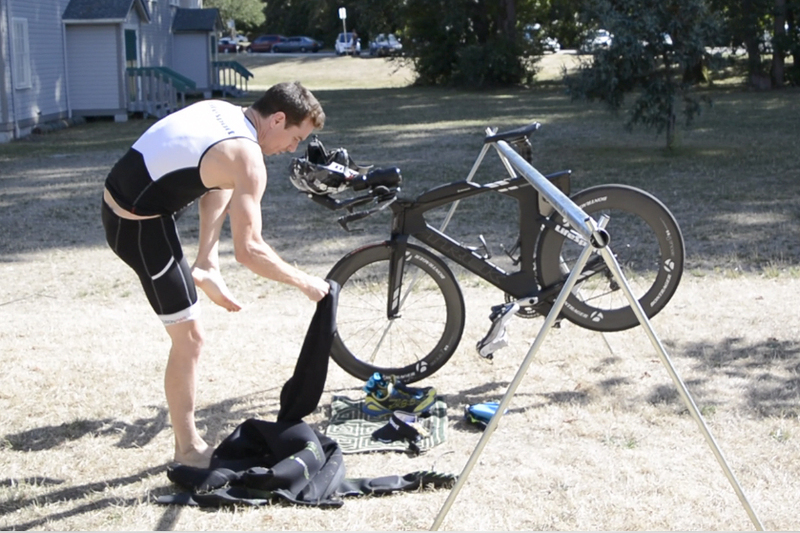 Shaving 5 minutes off your swim, bike or run takes a lot of work. With our tips and strategic organisation, you could potentially save even more time than this with only 90min of guidance and practice. These clinics are just as relevant for experienced athletes as they are for beginners. For the experienced athlete, 15 seconds faster in transition could be the difference between a podium spot in your age group. For beginners, these clinics will give you the knowledge you need to successfully navigate each transition. How to approach T1 from the water. What you need to consider for gear selection for a variety of different race situations. Organising your gear in an efficient manner. How to attach gear to your bike depending on what you need to carry. How to handle your bike. Mounting your bike with or without your shoes attached. How to visualize the process to prepare yourself mentally. Quick and efficient technique to get off your bike and through transition to your rack. How to organise your run gear. How to get your socks and shoes on quicky. Get a quick start to your run without wasting time. The triathlon transition clinics are conveniently located at the Coach Powell Studio on the West side of Jericho Park. The Studio is located at the South East corner of the building, the entrance is in the South courtyard. Parking for the triathlon transition clinics is free along Marine Drive. There is generally plenty of parking available. Please contact us if you have any questions about our triathlon transition clinics.